1 obi : silk ; 11.75 x 146 in. 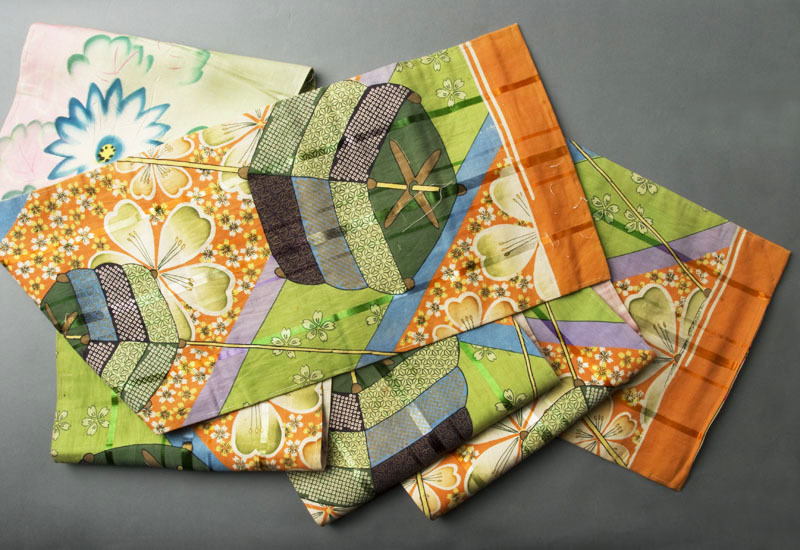 Double-sided rayon (jiinken) and silk obi with three-level boxes over orange, green, blue and purple diagonal patterns on one side and flowers outlined in pink and turquoise and leaves in green on pale green and pink background on the other side. 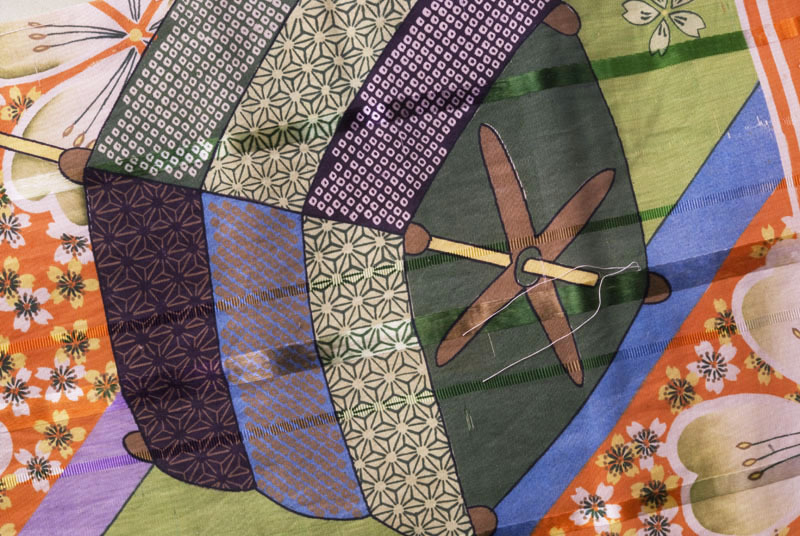 The first side features large green, light green, purple and blue three-level boxes in various patterns (stars & shibori dots) with a stick passing through the center over diagonal patterns of large sakura flowers edged in green fading to cream in the center over small yellow and cream sakura flowers on large orange background, scattered sakura flowers outlined in dark green on green background, and plain blue and purple diagonal stripes (about 1 in. wide); few smaller golden yellow sakura flowers along edges; and satin stripes are woven along the length of the obi. On reverse side flowers have pointed petals like open chrysanthemum with yellow with black circle of dots at center; flower stem, leaves and buds are suggested in creamy white lines on pink background. Jinken (rayon). Obi is rayon on both sides with silk in between. 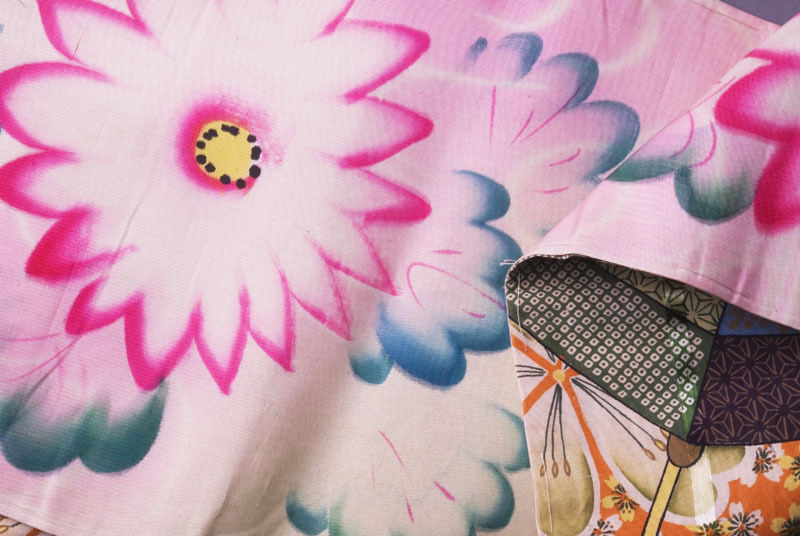 Japan used rayon in the 1930's because silk was expensive.